Matthew Hayden has produced an autobiography as tough and unrelenting as his batting. Having to battle so hard to claim a permanent place in the talented Australian side of his era, he made sure that once his chance came he made the most of it. It is refreshing on this side of the Tasman to read a story full of all the benefits of hard work and application towards achieving a goal. Those qualities are not so apparent in the less competitive structure of New Zealand cricket where international status is often acquired too early in the apprenticeship with the resultant downstream effects and inability to turn things around when hardship comes into the game. That's not to say Hayden did have an answer in those situations, initially at least. But he made good use of his early support systems to build a foundation later in his career, and what a solid base he had. That is apparent in Standing My Ground. Published by Penguin . Written in association with well-regarded Australian cricket writer Robert 'Crash' Craddock it has many lessons for cricketers the world over. Rather than being frustrated by non-selection, Hayden used it as a weapon. "As much as I felt ready for big-time cricket and desperate for any opportunity that came my way, I also knew I was far from the finished product. I was risk-averse...People have often said to me it must have killed me to play just seven Tests in the six years after I was first chosen for Australia, but it didn't. I was so dedicated to improving myself that I actually found those years rewarding." New Zealand featured significantly in Hayden's career, not least when he assured himself of selection for the 2007 World Cup on the back of an outstanding innings of 181 not out, much of it on one leg after breaking a toe. "I always felt we played our best against the Kiwis when we treated them with total disdain. Eventually they would wilt under the pressure, almost as if they believed they were inferior. But they were great planners and, at times, a feisty and very willing opposition," he wrote. "Because the Kiwis had limited resources, they felt they needed to squeeze absolutely everything out of what they had. I used to hate 'just getting by' against New Zealand, in that way that you'd take offence at being stretched by your little brother in the backyard. I wanted to completely destroy them because I felt there was not one area of the game where they were superior to us." 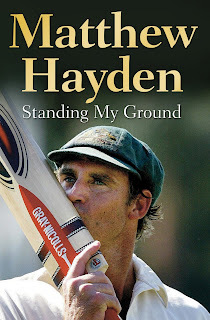 Hayden has shown a feel for the all-round involvement in cricket, not just as a player but through the Players' Association and now with Cricket Australia. It is a welcome trend in the modern era and as an observer he has a message for the media. Players are reading the papers less than before and there is a challenge for the media to learn to cope with constantly changing technology. "Cricket coverage must embrace new ways of communication to remain relevant, topical and fresh," he said. Challenged to itemise problems in the game, and possible solutions, he felt Tests deserved a bigger audience, remove the mismatches (effectively dropping Zimbabwe and Bangladesh), reduce the conflict between Tests and Twenty20, provide up-to-date venues for matches, reduce the number of confusing one-day competitions and establish a global calendar. This is much more than another player autobiography – it is a solid, sensible read by someone with a holistic view of the game. 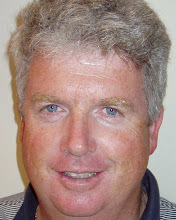 A journalist since completing training at Wellington Polytechnic, now part of Massey University's School of Journalism, I have worked in two stints on The Southland Times (the second 10 years as Sports Editor), the Marlborough Express and the now-defunct Evening Post. I left the Post in 2000 to take up the position of New Zealand editor of CricInfo.com based in Christchurch, NZ. Then in 2005, I was appointed senior editor of Sportal New Zealand, based in Auckland. While sport has been the preoccupation of most of my journalistic life, I have always maintained an interest in history, politics, geography and world events. An avid movie-goer and a lover of all sorts of music, I have also written several books. The title of this blog, View from Above, is a reference to a column I used to write at The Southland Times based on light-hearted ramblings witnessed from my rooftop pressbox in the grandstand at Rugby Park in Invercargill.